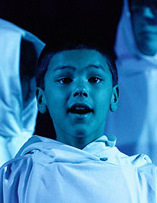 Bio: Tom began publicly appearing with Libera in 2002, at the age of 7 and has since become a Libera legend! He sang his first solo There is a Green Hill on Songs of Praise with Michael Horncastle in 2002 and established himself as a proficient singer of the high notes on Libera's album Free, which was released in 2004. Tom's voice is featured prominently on Stay With Me and I Am The Day, where he hits an incredible top C at the end of the song. In 2005, Tom's voice was even more prominent on Visions, where he received his first album solo on Always With You and sang two part solos with Conor O'Donnell on Ave Maria and Michael Horncastle on We Are The Lost. By 2006, Tom became one of Libera's principal soloists and he received three more solos on Angel Voices, on Salva Me, Going Home and the classic, Silent Night. Tom's voice dominated Angel Voices - Libera in Concert DVD and CD, as he performed five credited solos and several more part solos. The release of New Dawn in March 2008 saw Tom become, if possible, an even more decorated soloist, with six solos. In December of 2008, Libera released Eternal, with one new solo by Tom, You Were There. Many fans were sure You Were There was Tom's last solo, until the release of Peace in March 2010, on which he has the solo on Ave Virgo. Outside of Libera, Tom has also sung in one episode of Foyle's War, and recorded several tracks on Preisner's Silence, Night and Dreams. When he's not singing, Tom likes to play football (soccer) and do magic tricks with his friends! When Tom is an adult he would like to carry on with music and become either a music director or producer.